Costs of hair loss treatments. Consequences of not getting prompt treatment. Seborrheic dermatitis, scalp eczema and psoriasis. Myth #1 – It’s not the right shampoo, moisture levels or treatment. Myth #2 – Any ‘specialist’ treatment will solve my hair loss issues. Myth #3 – It’s just stress causing my hair loss. Myth #4 – It’s just hair loss. Nothing to worry about. Hair loss, regardless of age and gender, may affect a person’s self esteem and confidence. In more extreme cases, it may even lead to depression and stress, circumstances that are likely to put a dent on one’s productivity and physical health. Far too many people suffering from hair loss problems either suffer in silence or without ever seeking proper treatment. For those that do seek treatment, they often does so without learning about the effectiveness of each treatment, and whether each treatment is suitable for them. This often leads to wasted money and even more stress. This article aims to help you decide if any one hair loss treatment may be effective for you, the causes and symptoms. It also addresses some of the most common misconceptions on hair loss. If you are from a different country with a different climate, and who has just set foot into Singapore’s warm weather, it may be a small consolation to know that you are not the only one experiencing hair loss issues after such a shift. Many share similar problems. There has been much speculations and hearsay among friends on what exactly causes this phenomenal, including non-optimal moisture levels, humidity and local shampoo. Some simply attribute this to stress from work or from adaptation to a new environment. Before we go further into the most effective treatment for hair loss, let’s take a look at some of the most common myths on hair loss. Myth #1 – It’s not the right shampoo, hair care treatment or levels of moisture. Hair loss is by and large never due to not using the right shampoo. Switching to a brand that is organic or switching to baby shampoo will not cause any improvements either. Shampoos work by attaching themselves to dirt, oil and germs on a person’s scalp and hair; they are then washed off by clean running water. Shampoos meant for ‘oily’ skin or hair simply mean they are better at attaching themselves to the oil that is in your hair or scalp. They do not cause any chemical reactions that could lead to hair loss. The water used in washing, as long as they are clean and potable, should not lead to hair loss issues either. Tainted water containing germs and bacteria may cause infections to the scalp and skin, but this is mainly a different condition and is very rare in Singapore’s climate. 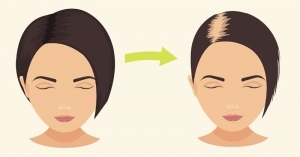 Hair care treatments such as bleaching, perming, rebonding and dyeing involve the use of chemicals. They do cause hair loss, but this loss of hair is primarily from breakage, and not from the roots. Such treatments damage the structures of the hair, leading it to break off. It does not, however, cause hair to fall from its roots on its own. To resolve breakage of hair arising from such hair care treatments, simply halt the treatment or where this is not possible, try using gentler hair care techniques such as brushing your hair in a slower motion with softer brushes. You may also consider changing your combs to bigger and wider toothed ones that exert less pressure on your hair. Myth #2 – My hair loss problem will be solved with ‘specialist’ treatment. When googling for ‘hair loss treatments singapore’, you will probably encounter a colorful mix of tricologists, aesthetics spas, tcms and natural medications offering a ‘one size fits all’ solution to all your hair loss problems. The thing about hair loss treatment is that a big component of its effectiveness is also dependent on initial diagnosis; is the treatment targeting the root of the problem in the first place? When seeking the right hair loss treatment, it is important to look at the service provider’s approach; does he or she take proper measures to make the right diagnosis, or does he or she simply wants to sell you a ‘standard solution’? Seek the advice of a trained aesthetics doctor who may present a scientific, professional and reliable approach to your hair loss problems. Avoid unaccredited ‘specialists’ who boast of wonder cures and bold claims however attractive their reviews or costs may be. Fees paid, however minor, are simply wastage if the treatment doesn’t work, while reviews may be exaggerated or easily manipulated to give an inaccurate outlook. It is important to understand the background and history of the treatment that you intend to undergo. The professional advice and treatment of a trained aesthetics doctor may not be the lowest in terms of cost, yett compared to other treatments that do not bear any tangible results, this is the avenue that might just solve your hair loss problems once and for all. It is almost important to correctly define ‘hair loss’. Loss of 60 to 100 strands of hair per day is actually normal for healthy adults, but let’s say if you are used to losing 30 – 50 strands of hair per day and then it suddenly increases to 100 strands per day, then this warrants a cause for concern. You may estimate the amounts of hair you are losing per day by observing the shower drain (is it getting clogged faster? ), the floor of your living premises, your comb and even your bed; do they appear to have more hair strands than usual? For females, you may also observe a wider hair parting and ponytail that seems to be thinning. Some other important factors to take note include whether or not there is a history of hair loss in the family and how serious. Pay close attention to any significant signs of hair loss and consult your doctor promptly for the correct diagnosis and treatment. Myth #3 – It’s just stress that’s causing my hair loss. Many suffering from hair loss goes to the doctor with a myriad of self-diagnosis and conclusions. They often get information from unreliable sources online or on the other end of the spectrum, from health websites so established that their information may be too technical to comprehend at times. Certain web forums and blogs, unethically, may even go as far as to promote wonder cures and treatments that are simply not backed by research and science. If you suspect stress to be the cause of your hair loss, it is safe to say that, yes, stress could be one of the causes of your hair loss problems. Stress, however, is more often than not the only reason why your hair is dropping. You may be experiencing a stressful period of life, maybe with relocation, and it coincides with the onset of the hair loss problem. The reason for this could be telogen effluvium, where hair on the scalp is taken to the end of its life cycle, causing it to fall off. This occurs typically around 90 days after you’ve experienced something stressful. Falling sick with high fever, infections and poor diets may also lead to telogen effluvium. Male and female pattern hair loss is one of the most common culprits of hair loss problems. They are due to hormonal changes in the person’s body, and are more likely to occur if the person has any family history in hair loss. See if there are any family member who has also experienced hair loss, especially at a young age. This is a condition involving the immune system of the body. The exact cause of this condition is not known but it is thought to also be linked to one’s genetics. Alopecia Areata often causes one or more patches of baldness that are non-scarring. They may be promptly treated with steriods that are injected and medications that are taken orally. More serious infections caused by bacteria on the scalp may cause hair loss and scarring if not treated correctly and in a timely manner. Tying your hair too tightly in a ponytail or similar may also result in hair loss. The scientific term for this is traction alopecia. Certain medications and drugs, such as those used to prevent cancer and antocoagulants, may cause hair loss as well. Myth #4 – It is just hair loss. Nothing to worry about. You will be surprised by how common cases of self-misdiagnosis are, but there is another more serious problem; ‘un-diagnosis’. An inflammatory disease of the scalp that is not diagnosed promptly can often lead to more pressing issues. A good question to ask yourself is whether you are experiencing other irritable symptoms associated with your hair loss. Is there itching, reddish patches or pain on the scalp of your hair? These could be signs that there is a greater problem beneath the simplicity of hair loss. When unusual symptoms are present, it is important to get the right diagnosis quickly by a trained and accredited specialist doctor. Do not attempt to self medicate or self diagnose as any error in judgement could potentially lead to more serious problems and scarring. The symptoms could be due to a number of causes such as seborrheic dermatitis, scalp eczema or psoriasis. They cause inflammations to the scalp and their symptoms tend to overlap, so proper examination by a specialist doctor is required to get an accurate diagnosis. Your doctor may evaluate your condition not just based on physical examinations, but also on your daily activities, family history, environment you are active in, people whom you’ve got into contact etc. Laboratory testing may be required or recommended in some circumstance for pin-pointing of the exact cause of symptoms. Seborrheic dermatitis, a condition caused by the yeast malessezia furfur, occurs when a person experiences abnormally high production of oil on his or her scalp. In tropical settings such as Singapore, the condition could be made worse by both the heat and humidity. Malessezia in itself do not lead to disease of the scalp and in turn hair loss. It is under high humidity that causes the condition to manifest into moderate to severe inflammation of the scalp. Flaking usually follows such inflammation. In more severe cases, that is where hair loss occurs. If after trying anti-dandruff shampoos or other over the counter anti-dandruff treatments, it is important to quickly seek the help of an accredited specialist doctor. An abnormally dry scalp may also lead to inflammation of the skin and in turn hair loss. If a person has a family history of psoriasis, scalp psoriasis may also lead to flaking on the skin, the same as dandruff. If you’ve come into contact with an animal or pet that has been infected with ringworm, the condition may be passed on to you. Have your scalp examined by a trained doctor promptly if you notice any unusual symptoms. Animals may harbor a form of fungal infection also called dermatophyte infections, which may be spread to humans. Such infections are more common among young children and may be associated with reddish, scaly skin and itchiness, patches with hair loss. Hair loss, in general, may be attributed to one or more of the above factors. Doctors determine the exact cause or causes of hair loss by carefully examining both the physical and laboratory aspects of each test. More in-dept microscopic examinations may be recommended depending on the complexity and severity of each case. It is important to speak with your doctor to understand the procedures involved, both in determining the cause or to follow up with any potential treatment. So what is exactly is a suitable treatment for your hair loss problem? When it comes to getting the right treatment, it best to use tested and proven methods after getting a proper and right diagnosis. If it has been established that hair loss is not from breakage but from the hair’s roots, then you may consider getting light treatments for encouraging hair regrowth and regeneration. In such treatments, light is used to stimulate hair growth. The process has been scientifically tested and evidence shows that such a procedure supports hair growth. Another popular, tested and proven treatment in Singapore for hair loss is the Regenera Activa Hair Loss Treatment, also provided by S Aesthetics Clinic. It uses capillary regenerative technology that stimulates your own body’s natural mechanism into regenerating new hair. The procedure involves a few injections of regenerative cells to the scalp. The Regenera Activa Hair Loss Treatment is FDA approved. You may read more about hair loss treatment. Most hair loss problems are age related and may be completely treated and reversed if diagnosed and treated early. Where there is no scarring involved, effective hair loss treatments may not only result in the slowing of hair loss process, but also in the eventual regrowth of new hair. It is thus important to have an in-depth discussion with a specialist doctor before commencing any treatment or medication. Certain inflammation of the scalp such as psoriasis, eczema, scalp folliculitis and seborrheic dermatitis do not lead directly to hair loss. Such conditions, when ignored, however, may lead to telogen effluvium, which is the loss of hair from prior illnesses. Such inflammations and conditions may all be treated fully with the right diagnosis and medication. They should be addressed promptly before they manifest into stages of hair loss. If it is has been diagnosed that an autoimmune disorder such as alopecia areata is causing your hair loss problems, possible treatments may include steriod injections and oral steriods. Steriod injections usually work for earlier stages of hair loss and has been observed to slow the thinning of hair. More serious cases of hair loss subsequently requires oral steriods for better management of the condition. Certain causes of hair loss may lead to scarring of the scalp; the follicle of the hair is damaged and regrowth is not possible. An example of such a cause is folliculitis decalvans, a serious form of scalp infection that constantly leads to inflammation. Tinea Capitis is another infection of the scalp caused by fungi. It is contagious, more common is children and could also lead to scarring and permanent hair loss. Prevention and early treatment works more effectively in such cases. Where symptoms are observed, seek help from a specialist doctor immediately. A healthy head full of hair is not impossible with the right diagnosis and treatment. While it may seem stressful and hopeless while a hair loss problem is ongoing, being adequately informed in the kinds of treatments available and root causes of your hair problem may help lead you to a better, healthier and happier lifestyle. If you looking for an effective and wholesome solution to hair loss, you may consider visiting S Aesthetics Clinic Singapore. One needs to understand that the root of your hair loss problem may only be solved with proper diagnosis by a specialist doctor. There are people who spend months or even years looking for solutions to their hair loss problems that simply do not work. Many fall into the traps of unscientific treatments, self-diagnosis or packaged deals that over promise results. By the time they find something that works, the damage to their scalp or hair loss problem might have worsened considerably or even become irreversible. Do not fall into this trap. Delays in getting prompt and adequate treatment for hair loss can be severe. Consequences may include permanent hair loss and scarring; this is true even for those at a young age. Any single cause of hair loss if left untreated may also lead to a combination of other problems that gradually or suddenly worsen the problem. E.g. a single inflammatory disease of the scalp may worsen and become a combination of a few inflammatory diseases. While such conditions may still be treated and improved on, treatment becomes significantly more difficult to implement; the amount of distress that a patient undergoes logically increases as well. Not to mention the costs for treating a more severe combination of problems. The recovery period that one has to go through are also exponentially much higher. S Aesthetics Clinic Singapore, conveniently located in the heart of Orchard, has helped countless patients with hair loss problems achieve wonderful results and a head full of hair. Our doctor, Dr Sii Sik Liong, is also known to be meticulous and remarkably gentle in his field, often giving clients an undisputed sense of security and comfort; there is no need for excessive bruising and pain. His eye for beauty is also unparalleled; while any certified medical expert may go through a procedure with you, when it comes to aesthetic treatments, an eye for beauty is equally if not more important than medical skills. It is important not to experience any unnecessary distress before, during and after a procedure. It is also important to obtain the desired results that you are looking for. Here at S Aesthetics Clinic, you can be assured that Dr Sii, together with his team of aesthetic consultants and service providers, can give you a complete and wonderful experience in beauty and aesthetics. We look forward to having you here with us. For more information about our pricing, services or to book an appointment with us, please feel free to get in touch with us at either +65 6235 0338 or this contact form. We are conveniently located at 9 Scotts Road, #07-07, Scotts Medical Centre (Pacific Plaza), Singapore 228210. © Copyright 2018. All Rights Reserved. S Aesthetics Clinic.